Akira Kurosawa is one of the world’s greatest filmmakers. His films have been acclaimed by critics the world over, and his celebrated samurai epics – featuring international star Toshirô Mifune – have inspired filmmakers as diverse as Steven Spielberg and Sergio Leone, and inspired countless films, including The Magnificent Seven. 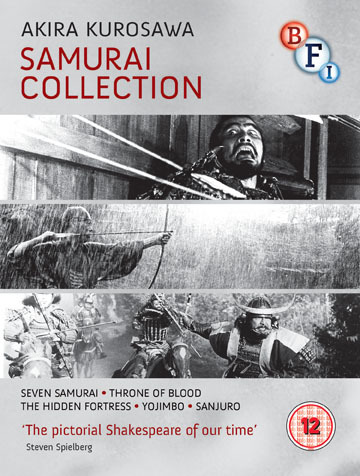 This indispensable Blu-ray collection contains digitally remastered High Definition presentations of five of Kurosawa’s greatest films, are accompanied with extra features including interviews with directors George Lucas and Alex Cox, feature-length audio commentaries and original theatrical trailers. When the residents of a small Japanese village seek protection they hire seven unemployed ‘ronin’ (masterless samurai). Paid only in handfuls of rice, the samurai remain distant from the villagers, knowing that their assignment may prove fatal. Unanimously hailed as one of cinema’s greatest masterpieces, Seven Samurai has inspired countless films, including The Magnificent Seven. In this brilliant re-imagining of Shakespeare’s Macbeth Toshirô Mifune plays a samurai fated to betray his friend and master in exchange for the prestige of nobility. Kurosawa’s bloody tale is a triumph of economic style, and the climactic battle scene is full of remarkable, and brutal, imagery. After the success of Yojimbo , Kurosawa teamed up once again with Mifune one year later to make this comedy of manners. The film, which follows a man fighting corruption in local government, offers a twist on the classic Samurai tale by gently, but perfectly parodying the conventions of the Japanese period action movie tradition.